MANILA, Philippines - The Philippine Business for Education (PBED) has released this 2014 the list of top performing schools in the country citing data from the Professional Regulation Commission(PRC) for Licensure Examination for Teachers (LET) from October 2009 to September 2013. PBED has collected data for Teacher Education Institutions (TEIs) with test-takers passing rate of at least 80% for both elementary and secondary exams and with at least 250 takers. In the Category A (at least 1,000 takers), Philippine Normal University (PNU) topped the list with 93% passing rate. Meanwhile, University of the Philippines (UP) - Diliman was named top performing school for Category B (500 - 999 takers). De La Salle University (DLSU) - Manila got 99% to secure lead in the Category C (250-499 takers). 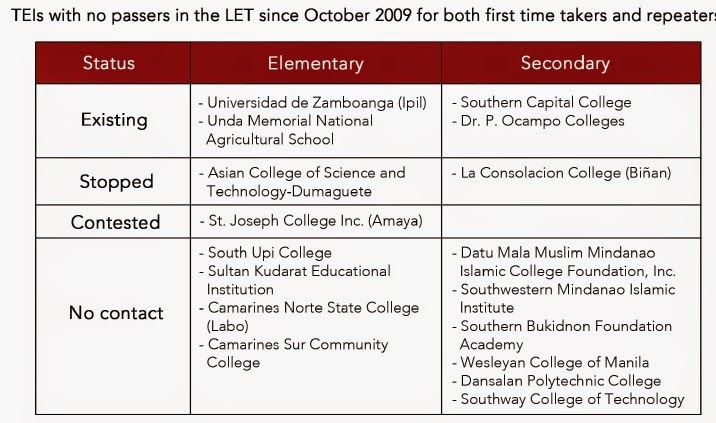 Aside from the top performing schools, list of worst performing schools in the LET from October 2009 was also released. Universidad de Zamboanga (Ipil), Unda Memorial National Agricultural School, Asian College of Science and Technology - Dumaguete and Saint Joseph College Inc. (Amaya) are among the worst performing schools for Elementary education. In addition, the data reveals 54% over-all passing rate for Elementary and Secondary in the LET National results during the monitored period. Passing percentage for Secondary is slightly higher, 56% compared to 52% for Elementary level. PBED, a non-government organization (NGO) aims to become the voice of the business community and to nurture consensus on key directions in education reform in the Philippines. Recently, they launched an online exploration tool for high school kids called FutureYou.ph. FutureYou.ph objective is to help students find out what jobs are in-demand, what courses are required, and what are the best schools that offer those courses.